scrambled egg, tomato, green pepper, onion wrapped in a flour tortilla with your choice of bacon, chorizo or ham. scrambled egg, tomato, green pepper, onion served on fresh Tripoli bread with your choice of bacon, chorizo or ham. omelette-style or sunny-side eggs, on an open faced sandwich, with refried black beans, your choice of salsa, & monterey Jack cheese. Scrambled egg, tomato, onion and jalapeño peppers. Served with chipotle salsa and grilled bread. three corn tortillas, omelette-style eggs, veggies, & served with black beans and your choice of salsa. with nuts, fruit & spices. mixed berries topped with honey & whipped cream. assorted cheeses served with Tripoli bread, olives, cherry tomatoes, green apples and candied walnuts. assorted meats, served with Tripoli bread, olives, cherry tomatoes, cucumber, and green peppers. cheese quesadilla made from a buttery flour tortilla with your choice of chicken, steak, pork, ham, shrimp, or veggies. a heaping plate of black beans, jalapeño, tomato, onion, peppers, cheese, and sour cream. choose three appetizers from the list below for a combination plate. beef & bean chili topped with monterey jack cheese, corn tortilla chips & sour cream. tortilla soup in a chicken broth and your choice of salsa, topped with monteray jack cheese and sour cream. *can be made vegetarian. thin lightly sautéed pasta seasoned with chicken broth, tomato, onion, garlic, and a slice of bread. served with tomato, cucumber, green peppers, avocado and red onion, and toast or a slice of bread. arugula lettuce, cherry tomatoes, topped with feta cheese, and toast or a slice of bread. zucchini, summer squash, onion, corn, tomato, garlic & jalapeño served in a light creamy sauce, topped with cheese, served with toast. sautéed chicken and potatoes in a chipotle salsa with garlic, scallions, onions, cilantro, served with white rice & black beans. sautéed steak & potatoes, mushrooms, onions, in a creamy spicy morita salsa, served with white rice & black beans. your choice of bbq, buffalo sauce, hot BBQ, served with french fries, sweet potato fries or tostones. black beans, rice, & stir fried veggies with your choice of salsa. shrimp and mushrooms in a white wine sauce, with lime, garlic and parsley, served with white rice. sautéed chicken, tomatoes, onions, garlic, mushrooms & coconut milk, served with white rice & black beans. chipotle bbq pork rack with sweet fries & veggies. fried white rice with chicken, onion, green pepper, garlic and soy sauce, served with tostones. 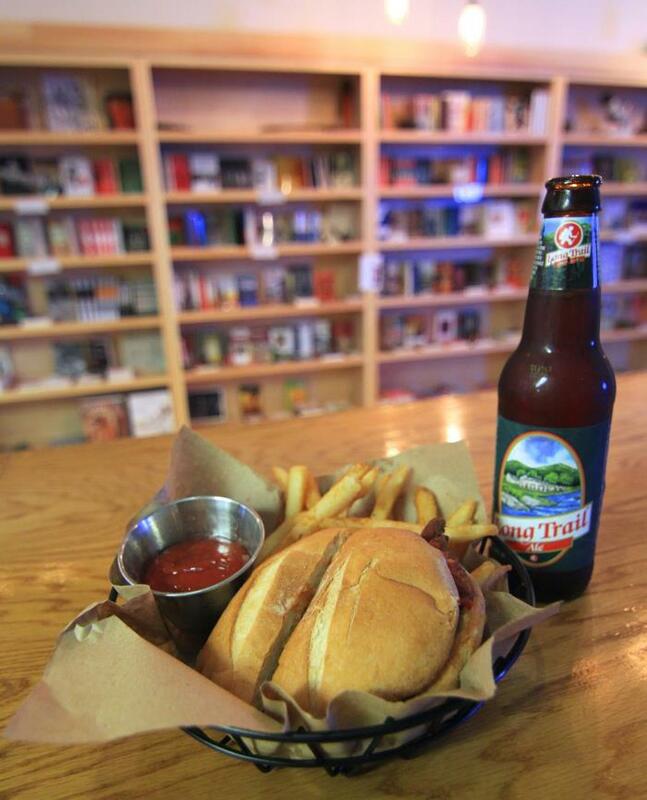 Chicken Torta with French Fries & Long Trail! your choice of meat or veggies, with lettuce, onions, tomato, avocado, jalapeño, chipotle mayo on tripoli bread, served with french fries, sweet potato fries, or tostones. steak, red onion, green pepper, jalapeños, avocado, and topped with queso dip. buffalo chicken, tomato, avocado, jalapeños, chipotle mayo, bleu cheese & lettuce. sunny-side egg, ham, cheddar cheese, tomatoes, avocado, red onion, jalapeño, chipotle mayo, & lettuce. Tripoli bread, refried black beans, monterey jack cheese. open-faced sandwich on tripoli bread, with avocado, arugula, tomato, garlic and oil topped with balsamic drizzle. ask your server for our freshly baked cookie selection, with your choice of ice cream. freshly baked brownie with your choice of ice cream, strawberries, chocolate sauce & whipped cream. vanilla, mint chip, chocolate, topped with chocolate sauce and whipped cream. sweet plantains topped with honey & sugar.